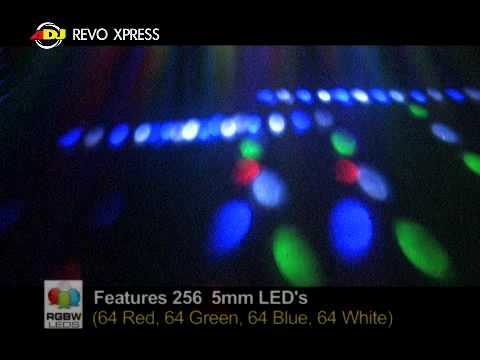 The American DJ Revo Xpress, part of the popular ADJ REVO Series, is designed for entertainers on the go (such as DJs, bands, Karaoke) that are looking to lighten their load by only bringing one or two lighting effects to their gigs, yet still looking for a high impact lighting show. Revo Xpress offers 256 bright red, green, blue and white LED beams, large beam coverage and a light weight, durable case design. This easy-to-use lighting effect can be run in Sound Active, DMX or Master/Slave modes. Revo Xpress provides all of the “ECO Friendly” features that mobile entertainer’s have come to expect from DJ lighting, such as: low power consumption, no duty cycle (run all night), low heat output, and extremely long LED life (100,00 hours). This effect can be used with or without fog. Considering purchasing the American DJ Revo X-Press DMX-512 Moonflower? Have questions? Ask people who've recently bought one. Do you own the American DJ Revo X-Press DMX-512 Moonflower? Why not write a review based on your experience with it. 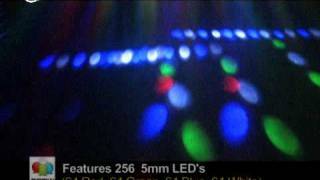 Seen a video for American DJ Revo X-Press DMX-512 Moonflower online or have you own video? Check out American DJ Revo X-Press DMX-512 Moonflower on DJkit.com!